This great mountain getaway is just miles away from the hustle and bustle of the big city. Big Canoe, Georgia is a charming mountain community with all the amenities of a great resort, but with the privacy of a home in the woods. This charming cabin has 4 complete bedrooms (1 King, 3 Queens) with a bonus room containing twin beds, perfect for kids. There are 3 levels offering varying degrees of privacy. 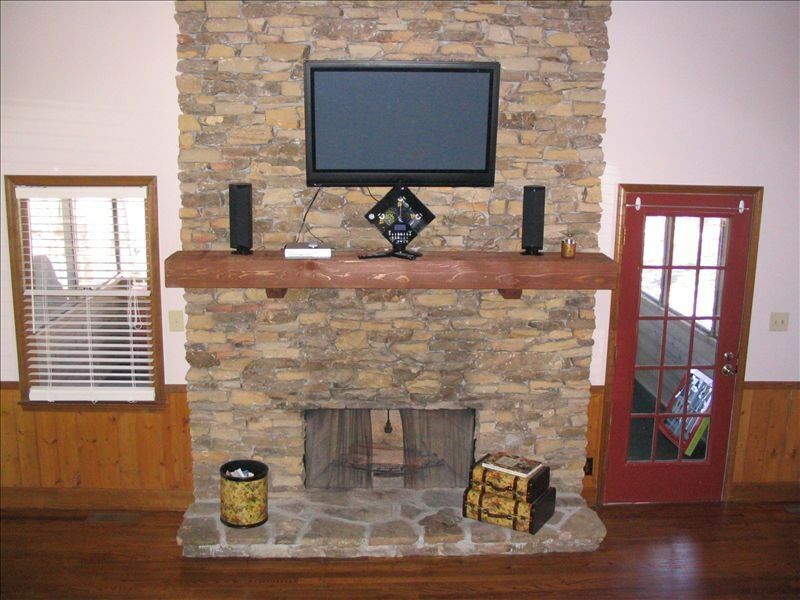 The main floor has a beautiful stone fireplace holding a 42 inch flat screen TV. The fully equipped kitchen comfortably sits 10. The screened in porch offers peace and serenity without the annoyance of insects. The deck allows you to enjoy the beautiful scenery over breakfast, lunch or dinner. There are TVs in every bedroom, which gives the TV lovers an opportunity to enjoy their favorite shows or video games. There is also a Wi-Fi connection for the techno-savy. This cabin has everything you need to enjoy your getaway. It is fully equipped with all of the niceties of home and beautifully decorated to give you that cozy mountain cabin feel. You will only need to bring your clothes and a spirit of relaxation. You can also bring your dearest friends, as there is enough parking for 4 cars. Within a short car ride, you will find the North Georgia Premium Outlets with over 140 of the finest outlet stores. Additional towels provided upon request. TVs in all bedrooms and main living areas. Plenty of room but dark and in need of cleaning etc. We have gone to Big Canoe for 4 years in a row and never had an experience like this. Two of the beds had dirty sheets including stains inside the comforters. Pretty gross. The master bedskirt and mattress pad had blood on it! Even the extra sheets in the master had hair in them. They came within an hour to get the soiled bedding but it took 6 phone calls to get them back finally after dinner. All the frying pans were teflon and so scratched they were unusable. The other pan was dirty. The kitchen had a broken cabinet and big light over the sink was not working so it was very hard to see in there. The pans under the oven all were filled with crumbs. The gas grill I was told they had was all rusted out and the cushions on the back porch were moldy. The master bath had no hot water pressure in the sink. No ice maker. They did have a few ice cube trays however. Not enough for 6 people to have ice a day though. We had to go buy a pan to cook with and a blanket to sleep with. We made the best of it but left at 7am on our last day because we were ready to be home. If you don't mind dark and pretty old its a good choice. I think who ever owns it may want to take a trip over to see it before renting it again. We sincerely apologize for your experience. We immediately fired the Management/Cleaning company and took the house off the rental market to address the issues. There is no excuse for your experience. When hiring the new management company, we used your experience and your feedback to make sure we hired a company able and willing to do the job. We do appreciate your feedback, although your experience was very disheartening to us. The property was very beautiful and cozy. We also enjoyed the beautiful Christmas decor. Overall, we truly enjoyed our stay. The house was the right size for our family. Very dark interior, light bulbs out, outside light fixture off the wall, air conditioner went out for about 24 hours. We are sorry for your experience and glad that we were able to rectify the lights and and AC as quickly as possible. I rented this cabin for a bridal party. I was so grateful that this cabin was available for one night, as most cabins in the area had a two night minimum. Teresa was very responsive to any inquiries I had. The cabin is absolutely gorgeous inside- AND HUGE! It was very well maintained and clean clean clean! It was so nice to wake up to deer outside the back porch. This is a perfect getaway if you are looking for a cabin in the mountains to get some amazing quiet time! I am considering renting it again for a family vacation in the future. Thank you, Teresa, for sharing your beautiful cabin! Having used "VRBO" before we were well aware that what we were to experience would be what we saw and more. This property did exactly that...and more. The accommodations were just as presented, the directions and amenity information were most informative and enjoyable. If there is anyone out there considering a stay in Big Canoe we can highly recommend this property. We had a wonderful stay! The house had enough room for all of us to have our bedrooms and bathrooms. I would rent again. We found the house clean and well maintained. I would recommend to family groups, friends, or relatives. Internet worked very well. You need to be aware that the property is in a mountainous area and in a "private resort" with strict speed limits and there are fees for use of their recreational activities. Also, you need to bring your groceries if you are planning to cook. We did eat out in the area which are a few miles away.